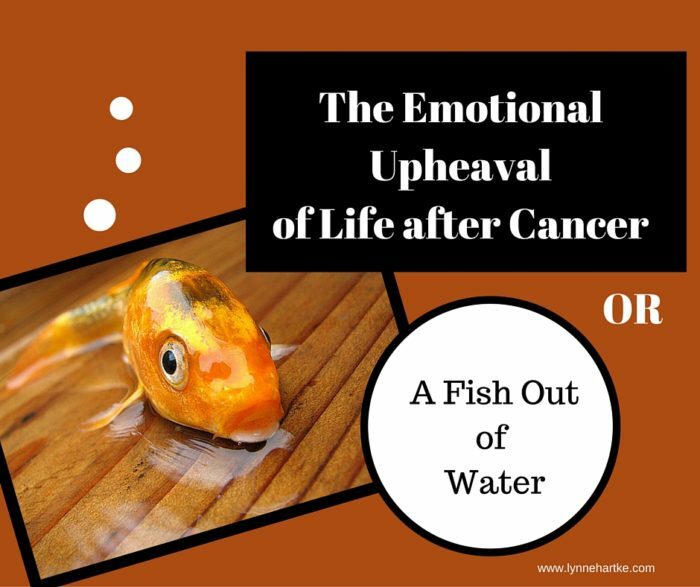 After cancer treatment, many survivors feel like a fish out of water, on the outside looking in, with emotions all over the place. How do you fit into life again? This is the third in a series on Life After Cancer. Often when treatment is over, a sense of numbness remains, a sense of living beside life, but not really in it. Kick that sucker in the teeth! Now, seven years later, after the loss of both parents from cancer and finally done with treatment myself, I am still surprised at what gets stirred up from the depths. Last week I returned, for the first time, to the area of the hospital where my mom had been admitted several times before her death 18 months ago. When I pulled into the parking lot, I found myself immediately dizzy and nauseated. I had gone to accompany a family member to an outpatient procedure and had no conscious thought about my past experiences in that place. Yet, suddenly all those powerful memories came flooding back with strange physical symptoms. I was totally unprepared! This surfacing of emotion can take cancer survivors by surprise, especially when you expect (and others also expect of you) to be elated and happy that treatment is over. I know my experience in the hospital parking lot is part of the grief, the walking through the losses of cancer, as are the feelings mentioned by Denise and other survivors. Part of the emotional healing of cancer, is acknowledging the emotional suspension, the emotional roller coaster, and the emotional losses. For many cancer survivors, the ability to look at the emotional upheaval only happens after they have the strength to look at it, sometimes months after treatment, but that can be difficult in a culture that doesn’t know how to handle “negative” emotion. Or you feel, or others feel, that you’ve passed the expiration date in regard to recovering from what you have experienced. What do you do with the emotion? Do you acknowledge it? Stuff it down? Ignore it? There was a very apparent reason for her sadness. There is a very apparent reason for your emotions also. You have experienced a traumatic event. And survived. So What Do You Do with The Emotional Upheaval After Treatment of Cancer? When Necessary, Seek Professional Help. Healing comes with the telling of your story. Again and Again. You probably need to tell it so many times that those closest to you will tire of hearing it. Okay, let’s be honest. They are probably sick of hearing about it. Join a support group. Your family will thank you. You will thank you. Surround yourself with others who share your story. I don’t know where we get the crazy idea that God only wants to see our happy emotions, that church is the place to attend when everything is going good. No. No. No. I can’t even tell you after thirty years of being a pastor’s wife, how many people disappear when the struggle is the greatest. And I get that. It was HARD for me to attend, and as a leader, to live out my loss on a visible platform, because like I said, cancer took my ability to stuff my emotions. Run to God when everything is upside down and horrible and when you are the most afraid. My favorite verse is this, because it doesn’t put down my fear. “When I am afraid, I will put my trust in you” Psalm 56:3 NLT. When, not if. I have a container of stones on my desk from hikes with my husband. Each one is a physical remembrance of a specific adventure. Over my desk is a collection of items that remind me of my mom’s beauty and how she wore lipstick to fight cancer, including an art piece by my daughter. Both are visual positive reminders to me on hard days. Survivor Marguerite has a strength necklace that she wore for five years during treatment as she prayed to God to give her strength for her journey. She still wears it during other difficult life situations. The necklace is a memory stone of God’s past faithfulness and a reminder to trust Him for strength in the Still Hard. Find an outlet to celebrate your journey. For me that meant surrounding myself with other survivors and getting involved in the cancer community. After treatment, I tried to just pick up the pieces and return to “normal” life as if nothing had happened, making my survival just a tiny blip on the calendar of life. But surviving cancer IS A BIG DEAL! With the big deal of surviving, I want to recognize that means laughter and pain, sadness and love, grief and joy. Surviving is a huge, important, complicated, sad, happy, the-rest-of-my-life, the-rest-of-your-life, wonderful, difficult experience. It’s a roller coaster ride, especially for a gal who gets sick on the merry-go-round, but worth every up and down bump of the journey. What emotions were difficult for you? Next week we will look at relationship challenges after cancer. Beautiful. I am not the cancer survivor. I am the care giver. I too feel like a fish out of water. My life has forever been changed. Every emotion you’ve mentioned is evident in my life. Not to the extent of a survivor, but it is real. Somehow my loved one, the cancer patient, expects me to live like nothing has changed. EVERYTHING has changed, even our relationship. He wants no tears, no emotions. I’ve never been that person. So I cry alone, in my bed, in the car, in the shower. If one more person says to me that I am not the one with cancer, that I should be the Pollyanna, he wants me to be, I just may lose what remains of my filter. Cancer’s destruction is not confined to only the patient. It radiates through the entire family. My loved one will in all likelihood not be a survivor. Medically there is no hope or expectation of recovery or survival. Daily I watch as their life is slowly drained from their body. I can not be the same. God gives hope and comfort. But tears still come. Anger still raises its ugly head. Frustration still nags. Appetite still fades. My face and body have aged quickly and I am just the caregiver. I will be the one left alone. How does not start again is not really a question but rather a startling reality.